After being nominated to the bench by Gov. John Kasich, Scioto County Prosecutor Mark Kuhn will be sworn in as the next adjudicator of the Scioto County Court of Common Pleas, General Division. A swearing-in ceremony is set for 3 p.m. Thursday in Scioto County Courthouse Room 308 where Kuhn will be trying cases after he assumes duties July 9. 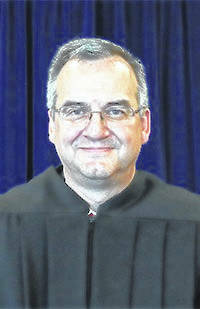 Judge Matthew McFarland of the Ohio Fourth District Court of Appeals is scheduled to swear Kuhn into his new role. Kuhn described his feelings upon taking a judge’s position as “bittersweet.” He added of course he is very excited about the opportunity. Kuhn added he has become very close with the staff of his office as well as many local attorneys. Kuhn replaces Judge William T. Marshall, who resigned abruptly in March. Kuhn must win in this November’s election to retain his seat for the remainder of Marshall’s unexpired term which ends Dec. 31, 2020. Replacing Kuhn in the prosecutor’s office is a bit of a complicated process, according to Julie Gearheart, director of the Scioto County Board of Elections. In the meantime, both Gearheart and Kuhn said Scioto County Commissioners have the right to name an interim prosecutor until the Republicans can act. Kuhn said he expects commissioners will move to fill any vacancy in the prosecutor’s office. Kuhn said he does not control who the Republicans tab to replace him. He did say Assistant County Prosecutor Shane Tieman applied for the position. Kuhn is replacing Judge William T. Marshall, who resigned abruptly March 16. Kuhn received his bachelor’s degree from Miami University and his law degree from the University of Toledo. He practiced civil law for 10 years, served as Portsmouth City Prosecutor for nine years, and is currently serving his third term as Scioto County Prosecutor. He also served as a member of the Ohio Prosecuting Attorney Association, the Scioto County Bar Association, the Southern District and Ohio Federal Judicial Nomination Commission, the Scioto County Budget Commission, and the Scioto County Records Commission. Kuhn also has served for many years on the boards of the Southern Ohio Task Force and Domestic Violence and the Hospice Advisory Board. Because of the July 4 holiday, both offices stated they were at reduced staffing levels and declined to answer any questions on McFarland’s potential appointment to the federal bench.